The Wizard of Oz performed at the Goel Center for Theater and Dance in February 2019. Architect Billie Tsien taps a key on her laptop and a single photograph of an amethyst geode appears on the boardroom wall. There’s no accompanying 3D, balsa-wood building model or life-size posters recounting her firm’s architectural awards, although they have won many. She’s focusing her audience’s attention on the geode. The rock is bumpy and fairly plain on the outside. Inside, it’s dazzling. Thousands of sparkling crystals erupt in all directions, exuding a deep purple glow. “That’s adolescence,” Tsien says. It is also her parti, or conceptual big idea. For the next hour, she and partner Tod Williams explain their vision for a new performing arts center at Exeter that, like a geode, will feature a quiet exterior and a dynamic interior that encourage the free expression of another, more hidden sense of self. 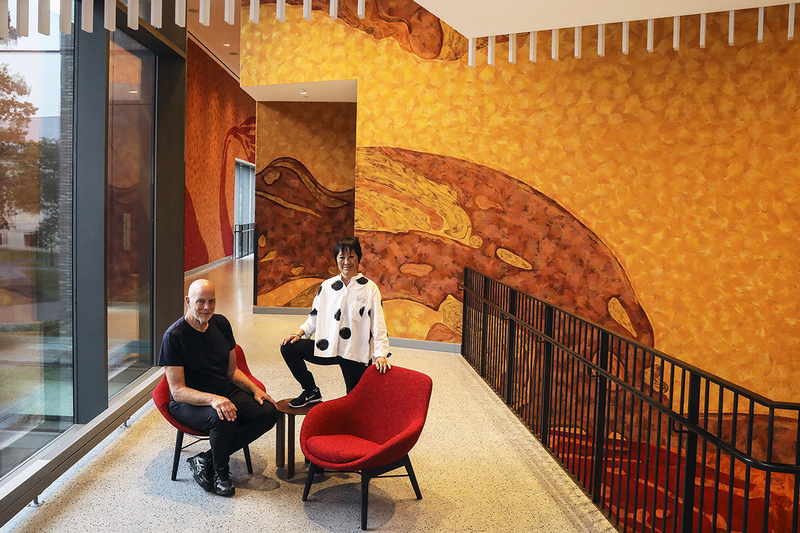 Architects Tod Williams (seated) and Billie Tsien hope their building will inspire curiosity, enable experimentation, and take students on a creative journey that will last a lifetime. Fast-forward four years, and The David E. and Stacey L. Goel Center for Theater and Dance officially opens to the first students. True to concept, the stark, modern cube, clad in muted gray brick, houses vibrant, highly sophisticated interior spaces where Exonians can take creative risks, refine their craft, and collaborate in formerly impossible ways. Aesthetically and functionally, the Goel Center fits the husband-and-wife team’s body of institutional work — including the Barack Obama Presidential Center in Chicago and the U.S. Embassy complex in Mexico City — which puts a building’s users above architectural whimsy. Despite having two performing arts centers on their architectural CV, for their firm, TWBTA, there’s no such thing as a generic theater building; each one tells its own story. The Goel Center tells a uniquely Exeter story. It’s one of optimism, of the power of Harkness, and of the belief that the arts play a critical role in education. Stage crew perched in the mainstage control booth command a complex array of audio and video boards to manipulate a show’s sound, projection and light. A pipe-grid of 100 LED lights make technicolor magic on the 40-foot proscenium, while rigging hoists fly scenery and trap doors invite actor trickery. Able to heft 33,000 pounds, the movable orchestra pit sinks 12 feet below the stage to carry an entire orchestra or heavy scenery from the garden level to the stage. Fitting the Exeter experience into a 143-foot-by-143-foot cube was a high-stakes game of Tetris. 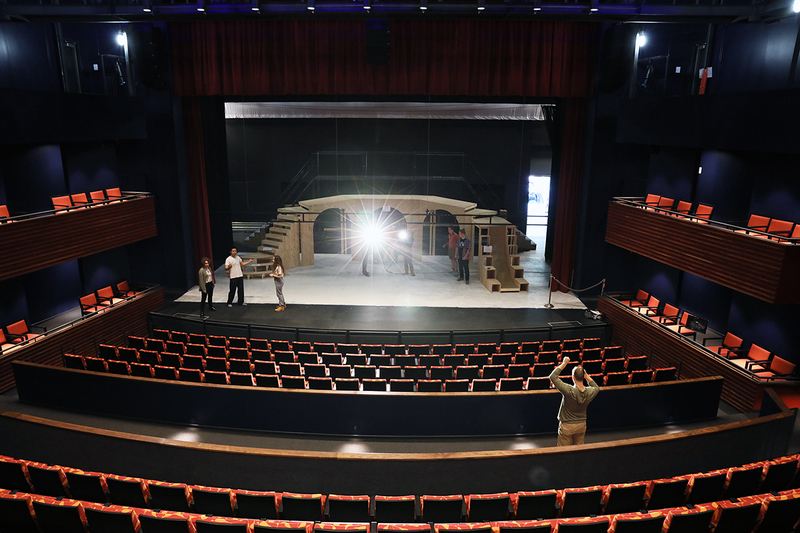 Vinik, the architects, former Director of Facilities Roger Wakeman and members of the theater and dance faculty all shared thoughts on how to place the necessary blocks of performance, teaching, rehearsal, technical and public spaces inside the building’s box. “We knew that the theaters, due to their sheer size, would be the rulers of space,” Williams says. 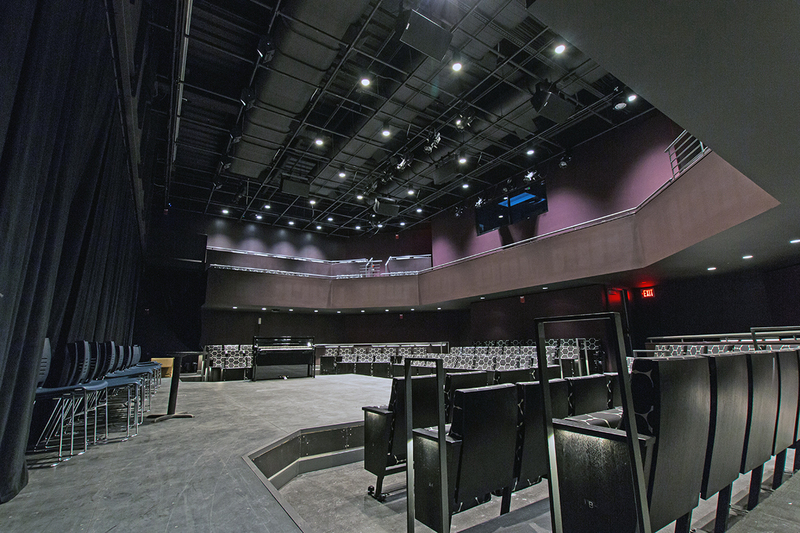 Spanning all four levels and seating 350, the mainstage theater fills the bulk of the 63,130-square-foot building and is large enough to host complex productions in theater or dance. Appointed with the latest high-tech machinery, it also provides the flexibility, versatility and ease of operation required for Exonians to perform as their most imaginative selves. Students can manipulate an intricate web of LED lights to produce limitless color combinations from the theater’s control room or take to the catwalks to make above-stage adjustments. There’s also a movable orchestra pit for musicians and advanced rigging hoists for the stage crew to fly curtains, lights or scenery. For limited-cast productions with simple sets, solo shows, or multidisciplinary collaborations that would be dwarfed on the mainstage, students can premier work in the smaller thrust stage theater. With seats for 150 and a rectangular forestage that extends into the audience on three sides, the interaction between performer and spectator is palpable. “It’s reminscent of Fisher Theater in that way,” says Theater and Dance Chair Rob Richards, “because the action comes right to the audience.” The additional performance venue also means that two productions can happen simultaneously — one on the mainstage and one on the thrust stage. And finally, the Goel Center is home to the Academy’s very first performance space designed specifically for dancers’ needs. Up until 2017, dance classes were taught on the second floor of the former Davis library, and before that in the basement of Thompson Gym. The new studio stars a classic three-layer basket-weave sprung floor with heat-sealed seams and Marley-finish surfaces; appropriate sightlines for choreography; and a ceiling-mounted projector to add video or animation to the show. 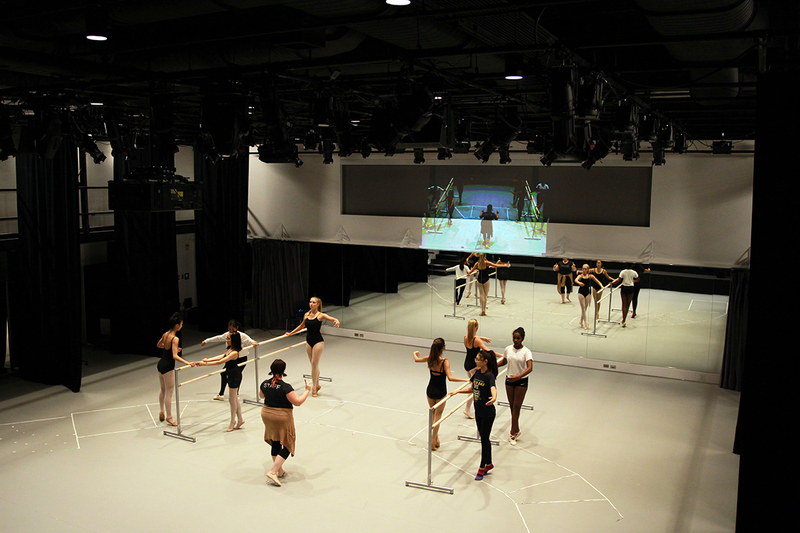 The 120-seat dance performance studio puts a dancer’s needs first, with its sprung floor, full-length mirrors and natural light. This wide variety of venue type and size offers all students — from the most focused and talented to the casual neophyte — a place to explore and perform. “The theaters themselves are meant to be laboratories in which all sorts of work, new and old, realistic, formalistic, presentational or otherwise, can be produced,” Vinik says. These well-equipped back-of-house spaces enhance the scope and quality of classes for students, bolstering and broadening the Academy’s existing curriculum of 23 dance and theater courses. They also support an alternative framework for understanding and appreciating the arts. “We wanted to make sure that this world is a world that’s balanced between the hand, the mind, the individual and the technology,” Williams says. The dramatic tension between actor and audience is heightened in the thrust stage theater, where the forestage reaches out into the crowd. The circulation of people and things is very clearly thought out in the Goel Center. “You need to be able to move things around in this box,” Williams says, “which takes a lot of planning. You need to be able to build a set and take it right onto the stage, then straight to storage or out to the dumpster.” The center’s scenery production shop is located directly behind the mainstage — placement that makes practical sense — especially when ferrying large-scale props to and fro. In the same way, the first-floor dramatic rehearsal studio matches the exact footprint of the mainstage (minus the wing space) and includes similar, but scaled-down technical AV instruments. This mirroring means that performers can move seamlessly from rehearsal to the performance space without missing a step, and that a production’s different constituents — actors, stage crew, dancers — can work concurrently. Plus, the building’s connective tissue, its unfettered passageways — behind the stage, over the stage on the catwalks, up to the control room — all allow straightforward access from one area to the next. “I think that flow, that’s an important thing to communicate to the students,” Skillern says. “They have access to it all.” A building-wide paging and communication system reinforces the interplay between spaces by making conversations among the tech crew, faculty and performers a button push away. “There is visual connectivity and a physical connectivity in all aspects of the design,” Skillern adds. Connecting not just the people and parts of a theatrical production process together, but the theater department to the dance department, drove the architectural design as well. “When Billie and I started to think about these components going together,” Williams says, “we thought you could have them connect, they could have this vertical relationship.” Hence, the central staircase in the main lobby, which is a physical link from the theater performance spaces on the main floor to the dance performance space on the third floor. This key form offers landing points, views and access to all levels of the performing arts. Each program fits in the same shell but retains its own identity, affording interdisciplinary collaboration. “The stair connects you to the dance level but the dance also has its own world,” Skillern says. The Goel Center not only provides an unmatched, professional-grade experience for every student, its very existence is a visible recognition of the value of the arts as a rigorous academic pursuit at Exeter. “I think there has been a major shift among educators,” Ream says, “from seeing the arts as a charming addition to the curriculum, to seeing it as part of the bedrock of an ideal education.” Indeed, the importance of arts training in adolescent development is reinforced by current educational theory and brain research. That’s not to say that the arts haven’t been valued at Exeter for centuries. In fact, from the earliest days of the school’s founding in 1781, “Musick” and “the Art of Speaking” were listed among the “Liberal Arts and Sciences” that the Academy would promote. It is just that student participation was constrained by the limits of the school’s facilities. There are now three separate departments devoted to the arts, including studio art, music, and theater and dance. More than half the student body is involved in a dozen dance clubs, drama clubs that perform weekly productions, and formal music ensembles. “I’m really hoping that some of the traffic from the gym — the people who think the last thing in the world they would ever do is anything to do with theater — are going to find themselves kind of wandering over and hanging out and getting involved,” Ream says. It appears to be working. Twice the number of students, compared to last year, auditioned for this fall’s production, A Midsummer Night’s Dream. On a crisp September day, backpacks and kicked-off shoes line the hallways of the Goel Center. Faculty and staff breeze through the building, chattering and lounging on the comfy red chairs scattered about the lobby. Among the passersby are architects Williams and Tsien. “I love seeing kids in the space,” Tsien says. The bustle, apparently, is the one thing you can never simulate in renderings. This is their first visit since the academic year began. They walk into each room, inspect each wall, outlet, fixture — no detail goes unnoticed. “I’m thinking like a dancer,” Williams says, dressed in signature black, as he enters the dance rehearsal space. He eyes the pop of gray paint on an interior window frame. He wonders out loud if, perhaps, it should be painted white. Shouldn’t the whole room be white, ethereal, he muses, to make the dancers feel freer to explore creatively? Tsien shares her thoughts. Williams listens. The conversation continues. They’re thinking and talking about the students and how they’ll inhabit and occupy this space they’ve created. It’s the architecture of Harkness.